The foxton website has been developed as an online directory of Foxton and Foxton Beach's businesses, services and organizations which are available to the public. The website is operated by Foxton Web Promotions as a not-for-profit undertaking, and this website and our organization is supported entirely by the community. Our aim is to provide an awareness and easy-find directory to all that Foxton has to offer. If you would like to list on our website or update your existing information, please visit the "Contact Us" page. Foxton and Foxton Beach are sister communities, situated on State Highway 1, 30 minutes from Palmerston North and 90 minutes north of the Capital City - Wellington. Check out the free activities on the Attractions page. Foxton is a thriving township with local and national branded businesses.. Surrounded to the North, East and South by agricultural and pastoral farming, Foxton also supports a number of commercial and service industries and an all-weather racecourse. The main shopping area, and attractions, are situated one block from SH1 adjacent to the Manawatu River Loop on the northern bank of the Manawatu River. Foxton Beach is a popular holiday area. The Manawatu River Mouth, estuary and ocean support sea and river fishing, whitebaiting, surfing, sailing and swimming. You will also see jet skis, power boats and kayaks. The Foxton Beach residential area has seen recent growth and development with new housing and substantial upgrading of earlier homes. The Manawatu River Estuary is a world reknown conservation area and is a popular spot for those watching the migratory bird species who inhabit the flats. 'HOROWHENUA DISTRICT COUNCIL'. : - Horowhenua is located north of Wellington and Kapiti, the district stretches from slightly north of the town of Otaki in the south to just south of Himatangi in the north, and from the coast to the summit of the Tararua Ranges. 'HORIZONS REGIONAL COUNCIL' : - Manawatu-Wanganui is a region in the lower half of the North Island of New Zealand, around the cities of Palmerston North and Whanganui. The region is administered by the Manawatu-Wanganui Regional Council, which for trading purposes is known as Horizons Regional Council. No local Taxi or Bus services operate within the Community. Click here to view info. Health Shuttle to Levin & Palmerston North operated by the Foxton Beach Community Centre. 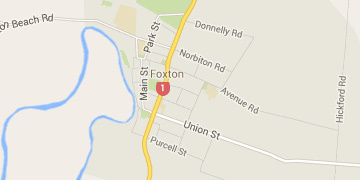 Foxton is located here, along State Highway 1. We are north of Levin, and south of Palmerston North.